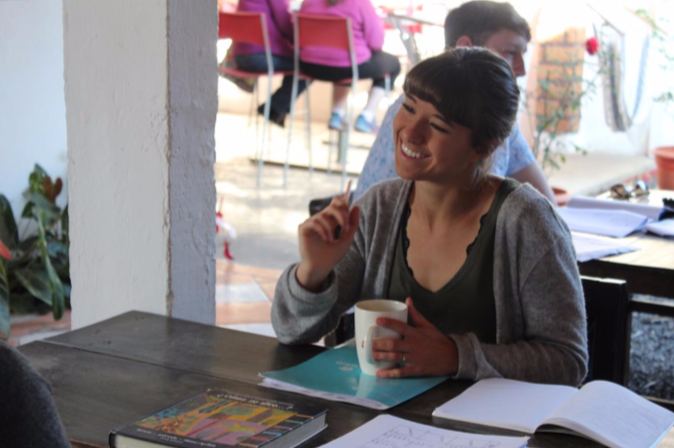 Learn Spanish, speak English to locals, and make a life-changing difference for so many in a small amount of time. Become a conversation partner and make a difference. Welcome to Guatemala! The former capital, Antigua, is a UNESCO World Heritage Site – an immaculately preserved colonial city with cobbled streets and ringed by spectacular volcanoes. Antigua is also the tourism center and party town of Guatemala. 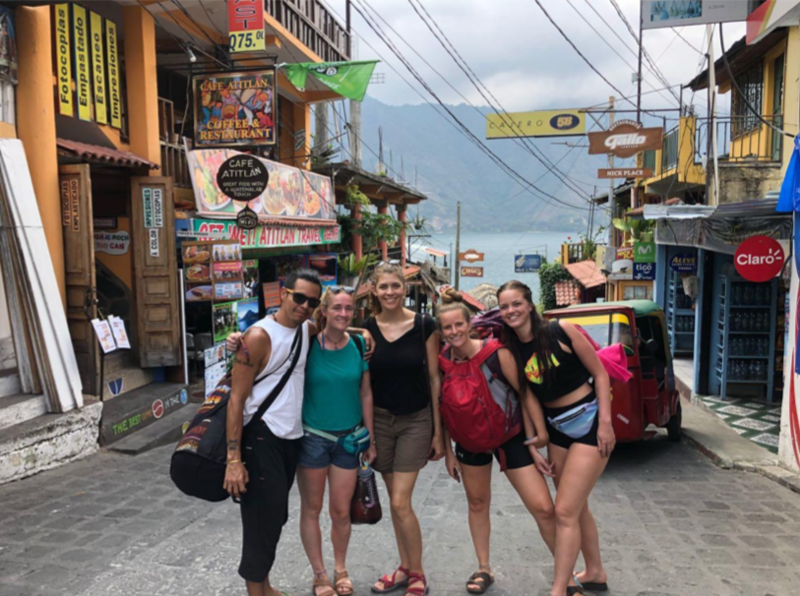 Cool bars and cafes boasting craft beers and single origin coffees plus lots to enjoy outside the city; adventure activities including trips to the picturesque Mayan villages around Lake Atitlan and day and overnight hikes to explore spectacular volcanoes. Learn (or improve) Spanish and Volunteer in Antigua. Enjoy homestay accommodation with 3 meals daily in the center of town. 2 mornings will include 2 Spanish lessons. The lessons are broken up into 2, 45-minute sessions. 2 mornings you will volunteer to assist in English instruction in a local school. 1 morning you will volunteer with adults. These will primarily be vendors who are eager to improve their English to speak with tourists who stop by their local shops. Each afternoon you have the option to explore and choose various local activities and adventures at an additional cost. $969 for one week and $1,349 for two weeks. A minimum of one week and a maximum of two weeks. 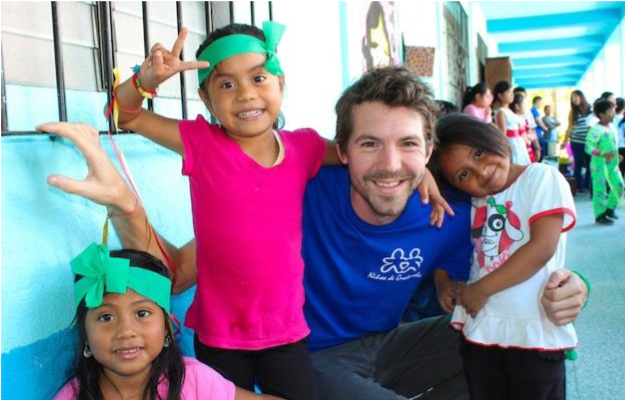 The fee you pay to volunteer in Guatemala goes to our 501(c)(3) non-profit public charity, The GeoVisions Foundation. The program donation for this experience covers our costs of placing you on the program in a safe place to live. The fee helps our non-profit to provide your accommodation, meals, insurance, pre-departure & in-country support. We provide 24/7 emergency service, manned by real people. We update our tutor materials and tutoring aids regularly and provide a real ESL Teacher who is here via email to give you personalized assistance if you feel you need ideas. You are supported from the moment you contact us to the time you return … and beyond, through our active Alumni Community. It is hard to calculate your spending money requirements, so think about any additional meals and travel during your time in Guatemala. Private room accommodation with a fully vetted and screened host family. There could be more than 1 volunteer at a time in a homestay. Airport transfers to and from your host family. 4 hours of Spanish lessons during the week. 2 days of volunteering in a local school. 1 day of volunteering with local adults. What is the homestay like? Your homestay is in a private room and thoroughly vetted with regular feedback and inspections. It is centrally located, provides 3 meals daily and always hosts two or more guests. You also have access to a ‘Social Enterprise Hub’ with a help desk open during regular office hours providing program support and ideas on how to enjoy your free time. This is where Spanish lessons are taken and free weekly cultural activities. In Antigua, your homestay is managed by Niño’s de Guatemala (‘NDG’). NDG currently work with eight centrally located family homestays on a consistent basis. There will always be two or more homestay guests staying in each property. Vetting procedures to work with NDG as a homestay are very thorough. Families must complete an initial questionnaire and interview in the NDG office. Following this, a formal home visit is scheduled to complete a thorough assessment of the home to ensure quality and safety. Homestays must also provide‘antecedentes penales y policiacos’ (Guatemalan police background checks) as well as references. Once a homestay begins working with NDG, regular assessments to ensure continued quality are conducted through client feedback (all clients are asked about their stay on a weekly or greater basis and complete a feedback form at the end of their stay). Regular homestay visits by the NDG management team take place at least once every 3 months. NDG operate a centrally located ‘Social Enterprise Hub’ with a help desk open during regular office hours providing program support and ideas on how to enjoy your free time. This is also where Spanish lessons are taken and free weekly cultural activities. What do the Spanish lessons entail? All our Spanish teachers are licensed and qualified, and lessons follow the internationally recognized Cervantes curriculum – a world-recognized leader in Spanish language tuition. After a short test on day one and discussion with your teacher to establish your learning-style preferences and interests, lessons begin on a one-to-one basis. There are two x 45 minute lessons twice weekly from 09:00 to 10:45. If you would like more lessons these can easily be arranged directly with your teacher. During my 3 days of volunteering, what exactly will I do? 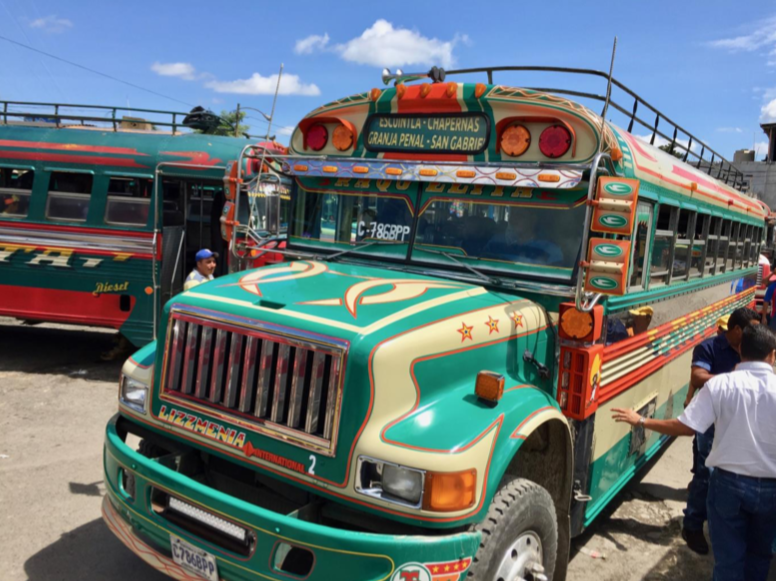 This experience is designed to give you a meaningful, productive and fun interaction with Guatemalan people, and is the best way to turbo-charge your Spanish! The volunteering activity changes from week to week and partly depends on what’s going on and your level of Spanish! This activity is designed to deepen your knowledge and connection with local people. What's the weather like in Guatemala? Guatemala has one of the most pleasant climates on earth – the tourist board refers to it as the ‘land of the eternal spring’ – with much of the country enjoying warm days and mild evenings year-round. The climate is primarily determined by altitude with low lying coastal areas generally hot with the welcome relief of sea breezes while in the mountainous areas such as Antigua generally fresh. The ‘dry’ season is generally November to April with most rainfall during summer months. During the ‘wet’season you can still expect the mornings to be nice and sunny with rainstorms in the afternoons lasting as long as an hour. It is warm rain though, and as soon as it passes, the sun usually comes out. Nights are usually dry. What should I pack for the program like this? beach towel/shades / dry bag / long sleeve rash vest/sun glasses with UV protection/sandals or good flip flops with strong soleLuggage – day bag is necessary for everyday use. Long sleeve trousers and shirt - as in all subtropical areas, insects can be a nuisance, especially in the evening. Long sleeved shirts and trousers are recommended to offer the best form of protection in the evenings and for road trips may take us to altitudes where it is frigid, e.g. scarf and warm clothes (inc beanie hats!) are required for Acatenango hike (3,500m+). Stationery – some teaching materials will be provided but you are required to have your pens, pencils, notepads etc. Photocopy of passport Travel tip – email yourself a copy of your passport and other necessary documentation. Sun Cream, zinc or other waterproof sun protection can generally be purchased locally. Medical Kit There are pharmacies locally but you should bring any particular medications that you usually require; especially prescribed medications. Insect Repellent and after bite insect repellant is recommended. If you are allergic to repellents seek advice before leaving your home country. As you view more photos and video, consider the program benefits. A second home with new friends and becoming more independent and confident. Add an international reference to your resume which helps with future job applications because of your experience as an au pair to a family in Switzerland and you're ahead of the game. Pack lite and comfortable clothing. 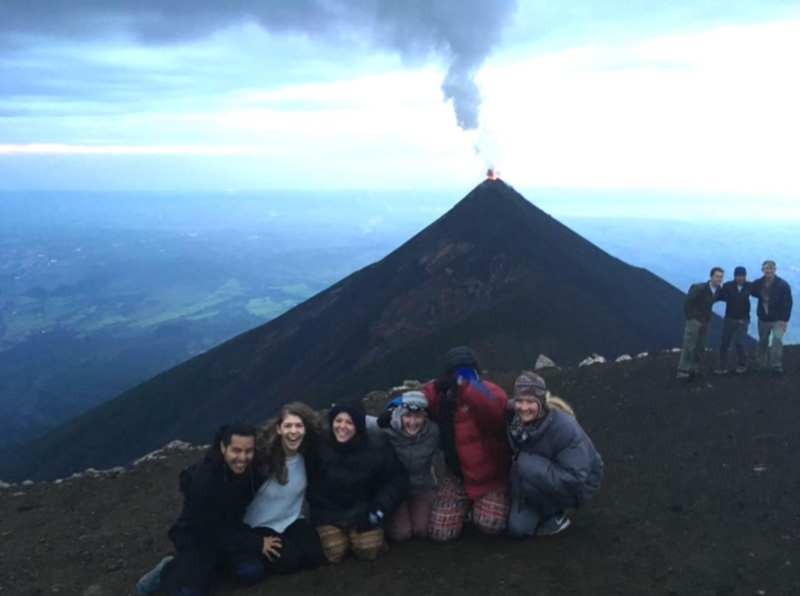 Hiking the stunning Acatenango volcano – one of many great activities to be enjoyed during your free time in Antigua. 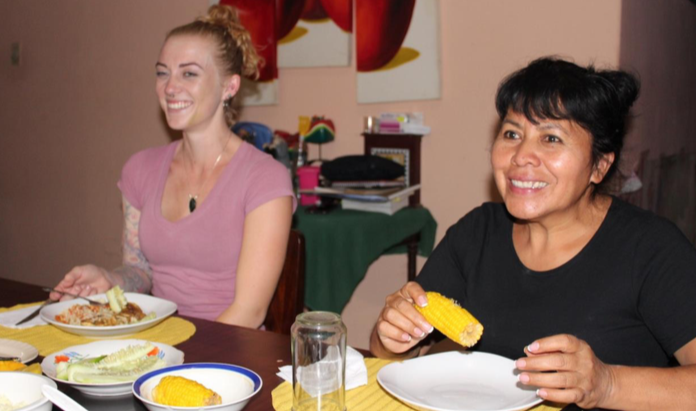 A GeoVisions volunteer and her host mom in Guatemala. ‘Social Enterprise Hub’ – Spanish lessons, free cultural activities and program support in Antigua. A GeoVisions volunteer at one of the local schools in Antigua.